Are you looking for an inexpensive but delicious burger in Boston? Here are 5 Burgers in Boston that will cost you five bucks or less! Enjoy! As a bonus, Cafeteria Boston on Newbury Street has $5 burgers everyday at the bar (fries not included). Also, there are a lot of great mini slider deals and beer and burger deals for cheap too in Boston, and you can find them all and much more on the Boston cheap eats page. 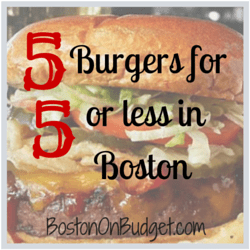 Do you know of a great burger in Boston for under $5? What is your favorite cheap burger in Boston without hitting a fast food chain?